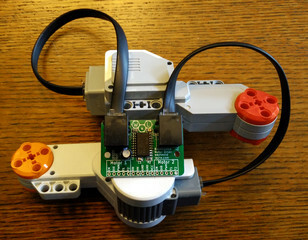 Use the Bricktronics Shield to interface LEGO Mindstorms NXT sensors and motors with an Arduino. Make: Arduino and Lego Projects is a great introduction to Bricktronics and includes sample projects. Solder together an easy-to-build kit and customize its flashing messages by holding it up to your screen! 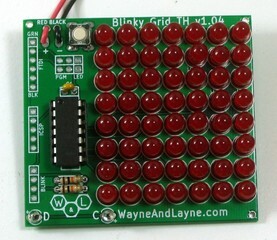 With more than 15,000 sold, the Blinky kits are our most popular kit! Hook your Arduino up to your TV! The Video Game Shield lets your Arduino connect to your TV and Wii peripherals like the Nunchuk and the Classic Controller. The Video Game Shield generates audio and black and white video, and comes with sample programs. Scroll custom messages and animations. Use a computer screen to customize it! Drive a pair of NXT or EV3 motors with any microcontroller. Wayne and Layne has more information on all of these projects on the Wayne and Layne blog. If you're not quite sure what you want, and want some help picking something out, we've created a gift guide. Need some help? Have a question? We have an email form and a public forum, and we will get back to you quickly! Note: Wayne and Layne, LLC and our products are not connected to or endorsed by the LEGO Group. LEGO, Mindstorms, and NXT are trademarks of the LEGO Group.